...... or other MP3/MP4 players. * All Flip video camcorders support - The Flip Ultra, the Flip Ultra HD, the Flip Video Mino, and the Flip Video Mino HD. * Video Trim - Trim your unwanted video segment, only remain your favorite video clips. * Video Join - Join multiple flip video files into one file by tick Merge into one file option. * Crop and Customize Video Frame Size - Customize video frame size according to the scale of cropped video. * Apply Effects - Apply effects like brightness, contrast, saturation, grey, emboss, and old film. * Support Batch Conversion - Convert multiple flip video files at one time, making your conversion much easier. 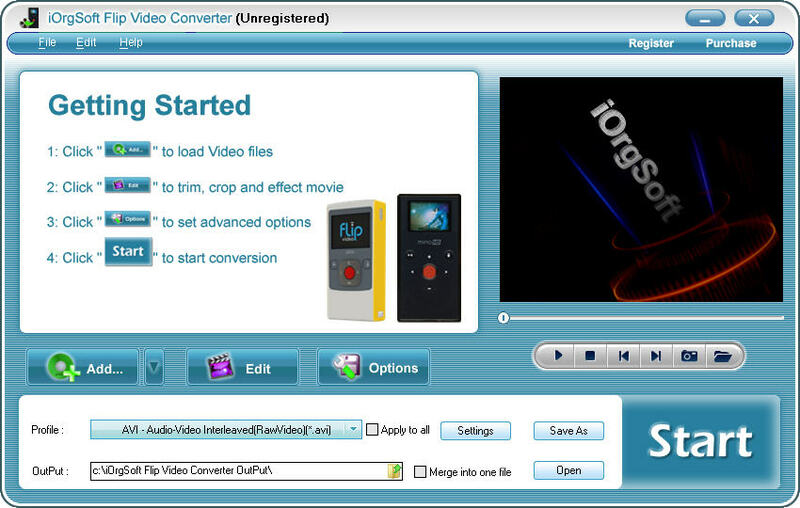 iOrgSoft Video Converter is a versatile yet easy to handle video converter. iOrgSoft AVI Converter convert almost any type of video files to AVI format. Convert Video to iRiver Mplayer, Volcano, T series, E series and PMP series. SWF Converter is an easy to use application for converting your video to SWF. Qweas is providing links to iOrgSoft Flip Video Converter 4..0.1 as a courtesy, and makes no representations regarding iOrgSoft Flip Video Converter or any other applications or any information related thereto. Any questions, complaints or claims regarding this application iOrgSoft Flip Video Converter 4..0.1 must be directed to the appropriate software vendor. You may click the publisher link of iOrgSoft Flip Video Converter on the top of this page to get more details about the vendor.